Every student of computer science, who has managed to keep even a tiny shred of attention at their algorithms course, should know that sorting numbers is a task that requires at least time in general. There are some special cases, such as sorting small integers, where you can use counting sort or radix sort to beat this baseline, but as long as your numbers are hypothetically arbitrarily large, you are stuck with the lower bound. Right? Well, not really. One thing that many algorithms courses tend to skim over rather briefly is the discussion of the choice of the computation model, under which the algorithm of interest is supposed to run. In particular, the bound for sorting holds for the comparison-only model of computation — the abstract situation where the algorithm may only perform pairwise comparisons of the numbers to be sorted. No arithmetic, bit-shifts or anything else your typical processor is normally trained to do is allowed. This is, obviously, not a very realistic model for a modern computer. Let us thus consider a different computation model instead, which allows our computer to perform any of the basic arithmetic or bitwise operations on numbers in constant time. In addition, to be especially abstract, let us also assume that our computer is capable of handling numbers of arbitrary size. This is the so-called unit-cost RAM model. 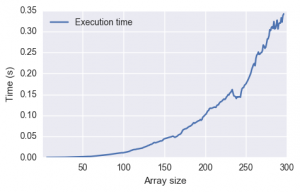 It turns out that in this case one can sort arbitrarily large numbers in linear time. The method for achieving this (presented in the work of W. Paul and J. Simon, not to be confused with Paul Simon) is completely impractical, yet quite insightful and amusing (in the geeky sense). Let me illustrate it here. And voilà, the sorted array! As presented above, the method would only work for arrays consisting of distinct non-negative integers. However, with some modifications it can be adapted to arbitrary arrays of integers or floats. This is left as an exercise to the reader. There are several things one can learn from the "Paul-and-Simon sort". Firstly, it shows the immense power of the unit-cost RAM computational model. By packing arbitrary amounts of data into a single register of unlimited size, we may force our imaginary computer to perform enormously complex parallel computations in a single step. Indeed, it is known that PSPACE-complete problems can be solved in polynomial time in the unlimited-precision RAM model. This, however, assumes that the machine can do arbitrary arithmetic operations. If you limit it to only additions, subtractions and multiplications (but not divisions or bit-shifts), you still cannot sort integers faster than even using infinitely-sized registers (this is the main result of the Paul and Simon's article that inspired this post). Not obvious, is it? Of course, real computers can usually only perform constant-time operations on registers of a fixed size. 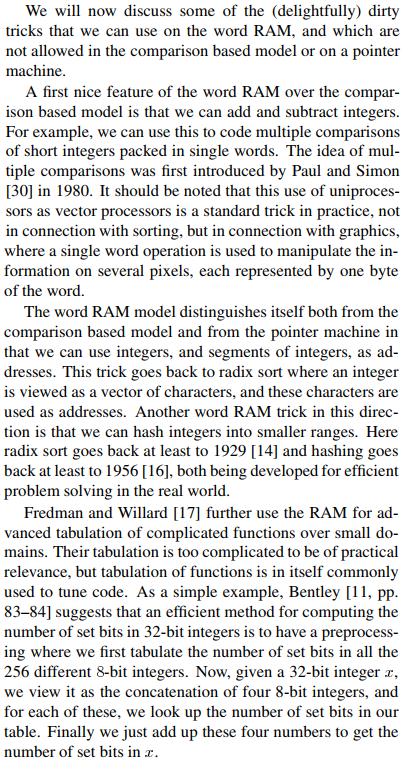 This is formalized in the -bit word-RAM model, and in this model the "Paul and Simon sort" degrades from a into a algorithm (with memory consumption). This is a nice illustration of how the same algorithm can have different complexity based on the chosen execution model. In case you need the full code of the step-by-step explanation presented above, here it is. I suspect that the modern CPU-s with integrated FPGAs make it possible to use a sorting accelerator that uses the bubble sort algorithm with a twist that the comparisons are done by hardware compare-swap blocks that work _almost_ in parallel. 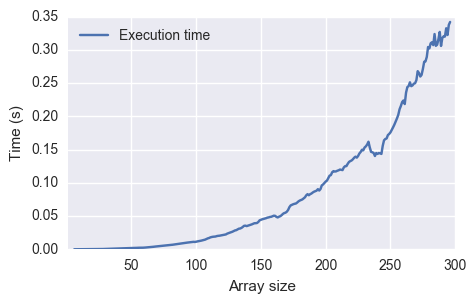 The length of the sortable array will be very short, but if the hardware based sorting is used to replace the last few recursion steps of the quicksort algorithm, then may be there's some acceleration. I guess sorting networks should lend themselves very naturally to parallel FPGA implementations. I haven't seen actual examples of their hardware use, though.